with automatic watermarking + import & synch from Final Draft! Write in Dramatify – alone or as a team. Or, import and synch from Final Draft .fdx files. Seamless integration with breakdown, scheduling and all the other features in Dramatify. When the team have the screenplay in their favourite device, in its entirety or integrated with the call sheet, you know you have saved a lot of trees as well as your own production resources! Be honest with yourself; how many pages of screenplays have you printed and consumed in your career? Multiply that with the average team size and yearly productions, and we start talking about substantial amounts of trees and time dedicated to handle all that paper. While there used to be no alternatives to paper, Dramatify allows you to distribute the screenplay to your team so they can read it on their computer, tablet or phone. No heavy paper stack to carry around on location! Of course, they can print it as well if they really need to (just remember all those trees!). The easiest way to work with screenplays in Dramatify is to upload a Final Draft-compatible file, a .fdx. It integrates seamlessly with script breakdown, scheduling, characters, sets and call sheets. Apart from Final Draft, there is a whole host of other screenwriting programs that can export to the .fdx format (see below). And when you or your screenwriters have done script revisions, just import the new version and seamlessly synch with all the production information you already have in Dramatify. And, it works just as flawlessly with any number of episodes, even if you’re thinking of a 3 000 episode series! 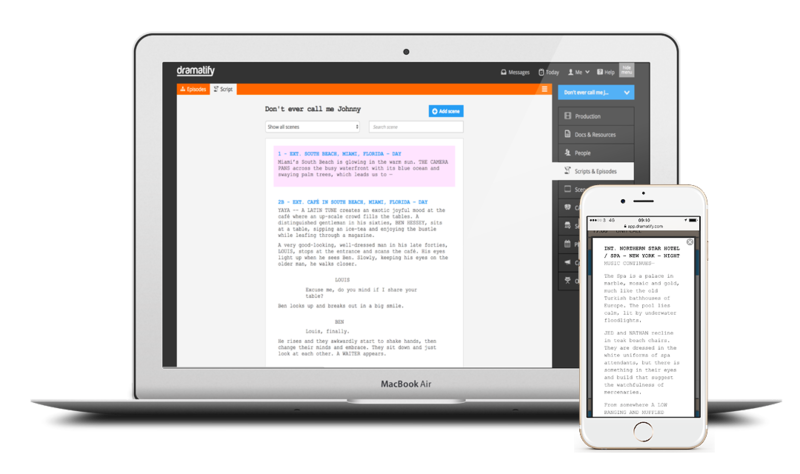 While Dramatify isn’t positioned as a premier screenwriting software, it’s great if you want to do collaborative writing. Each scene is edited separately, like an index card, so you can quickly create an outline and then fill in the story. You and your collaborators can work on different scenes at the same time without risking that anything gets overwritten. We are also the only screenwriting solution handling all languages, including right-to-left languages like Arabic, Hebrew and Farsi. With Dramatify, you can rest assured that the entire team have the same – and latest – version of the screenplay in their pocket, tablet or computer. But just to be utterly sure, we have kept the traditional Final Draft versioning colours so you can see with a glance if a scene have been revised! With Dramatify, you don’t have to pay extra for screenplay watermarking and tracking, nor distribution. It’s already built in! Learn more on how to convert screenplays that are written in Screenwriter, Celtx, Word or are a PDF or other format.